I have been sketching for 20+ years. Drawing with pen requires I spend more time looking and observing. When I put the pen to paper I do it with a greater sense of awareness. I spend more time looking at my subject. Since I can’t erase I slow down and pay more attention to how I’m holding the pen, the pressure, the speed, the ink flow… All of these things mean I’m more involved with the experience. I draw slower and with a greater awareness. About 7 years ago I wanted a pen that would do more than simply get the job done. I’d grown tired of cheap pens and wanted something that was enjoyable to hold, look at and responsive to my touch when sketching. I started exploring fountain pens. Little did I know how big the fountain pen world was...I was lost! So many new terms, filling mechanisms, ink, nibs… That's when I stumbled upon Goulet Pens. At last I was able to make sense of all the terms, option, nibs, inks... The company is amazing, website is great, technical support, videos, how to, tips and great prices! At his point I’ve got to say, I love sketching with fountain pens BUT I'm hesitant to recommend specific brands when asked. It's difficult to know a person's skill level, if they’re hard on things, personal style, price range…and nib size. Goulet Pens are some of the best folks I know for: information, tutorials, videos...and purchasing pens. My first fountain pen was a LAMY Safari. At $30.00 these pens are great starter pens and won’t break the bank. You can even buy replaceable nibs. Last time I looked LAMY replaceable nibs were $15.00. You use ink cartridges or bottled ink. You’ll need the cartridge adapter for bottled ink. It's a good pen to learn with and you’ll also learn how to care for a fountain pen. Yes…fountain pens require care. My next fountain pen was a step up. The Pilot Falcon (previously known as the Namiki Falcon) is an iconic pen. It’s most famous for its 14k gold soft nib, which provides line variation with your writing/sketching pressure. The pen is wonderfully responsive and gives line width variation. And then I was in Italy…Florence to be exact. I was scheduled to teach two workshops in Lucca. Before the workshop I spent a fews days in Florence sketching and painting. I was staying at a hotel just walk across the Ponti Vecchio on the right hand side at the first street. My room over looked a sign that said, PINART. Now seriously, did you think I would pass without going in? Once inside, I met Federico Pineder, the shopkeeper. He was friendly, knowledgeable and let me try a few many pens. 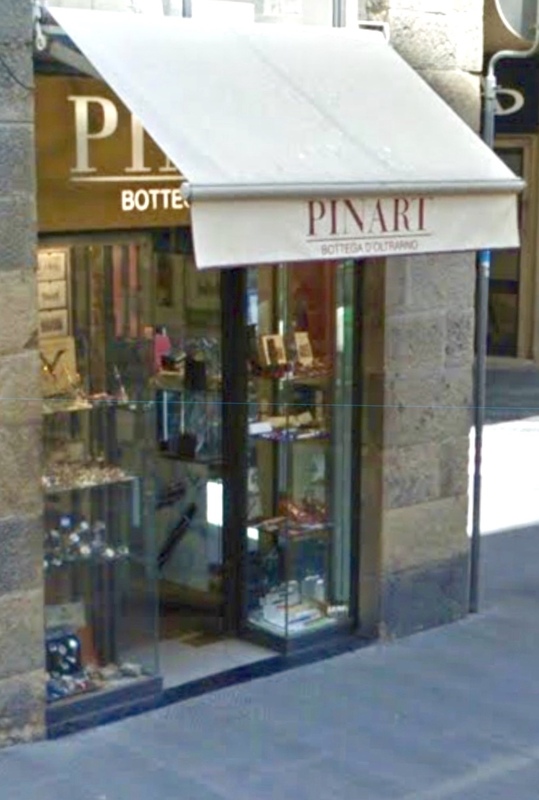 If you’re ever in Florence be sure to visit PINART. I have 6 fountain pens from gouletpens.com. Three of the pens are TWSBI Ecos. I also have a Lamy Al-Star, a Pilot Metropolitan, and a Platinum Preppy. You can probably guess which is my favorite. Two of my Ecos are limited edition pens. The most recent one has a 1.1 stub nib. These are pens with piston fill mechanisms. They can hold nearly 2 ml. of ink. I am looking forward to seeing the next limited edition Eco. Donna, Sounds like you’ve started a nice collection. What ink do you enjoy? I like DeAtramentis Document or Archive inks. I like the Document inks because they can be mixed together to create new colors. I'm not sure if the Archive inks and the Document inks can be mixed together, though. My first pen was the Platinum Preppy and I just got some Platinum Carbon Black cartridges to go with it. But, I've been saving the empty cartridges and when the current cartridge is used up, I will probably fill the cartridge with the Archive ink. The Preppy has a fine nib; but, since it's a Japanese nib it is really fine. It's finer than the fine nib that my Al-Star has. I use Noodler's American Eel Black in my first TWSBI Eco. When I tried the Noodler's American Eel Turquoise in my second Eco, it was too wet and leaked out. The American Eel Black works well in my Eco. It doesn't dry as fast as the other inks; but, it's fast enough for my purposes. I’ve always adored your beautiful paintings and your wonderful sketches. And, I have been to PINART in Florence! We were there a few years ago with my brother and sister-in-law and she is as passionate about pens as you are. What a fun little shop! You will want to talk to us all more about inks as your work with fountain pens continues. I love my Lamy Safari and it is my go-to. But finding the right ink for me took awhile. I wanted one that would not bleed when I washed over it! Noodlers Lexington Grey works better for me than any other I've found so far. Yes....inks are a subject all by themselves. I had linked to Goulet Pens in my 2nd to last post on my blog because I am quite obsessed by fountain pens. I have 4 LAMY Al Stars and love the grip, the nibs, the colors, everything! I've just discovered the fun of matching my pen colors to inks, for writing. I would go to Europe just for the pen & stationery stores! We don't have them here, so that's where Goulet comes in. And Goulet's videos are entertaining! I agree with you, everyone has to find their own pen. Liz Steele likes one of the LAMY's that would be too long for me...So many out there these days, & so many inks! (I also have 2 more expensive pens, a Pelikan & a Parker from years ago, but the LAMY's are just super.) I like Platinum Carbon ink for drawing (waterproof) & enjoy Noodler's & other brands for color. Love that Goulet sells little sampler bottles. You’ve got the pen “bug” too! Goulet Pens are great for so many reasons. Funny enough my favourite pen is also my cheapest-The Platinum carbon pen from Japan-about £6-it has a lovely fine nib!